The list of retailers removing hoverboards from their virtual store shelves after receiving a warning from federal safety regulators grew again today, with Amazon stopping the sale of the self-balancing scooters for the second time. Back in Dec. 2015, amid the initial news reports of hoverboard fires, the online retail giant pulled the scooters and asked manufacturers to provide documentation about their safety standards. A month later, the company offered refunds to customers who returned their hoverboards. Amazon’s most recent action comes just days after the Consumer Product Safety Commission, prompted by multiple reports of hoverboard batteries exploding or catching on fire, sent a notice to retailers and manufacturers that all self-balancing scooters on the market are currently considered unsafe and should be removed from stores if they don’t meet certain safety standards set by the Underwriters Laboratory. 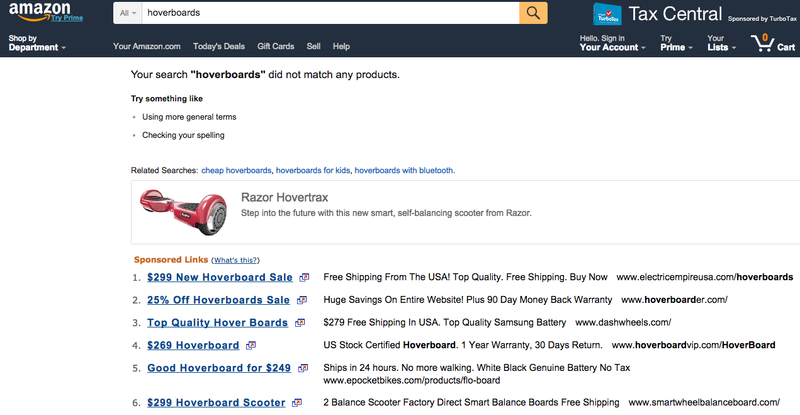 A search for hoverboards on Amazon’s website returned no results on Tuesday, Mashable reports, noting that the only related items are accessories for the devices. Most pages for specific brands return blank pages, while Swagway’s page contains a “temporarily out of stock” notice. Additionally, an ad for a Hovertrax self-balancing scooter on the site returns a 404 error page, Mashable reports. Consumerist has reached out to Amazon for comment on the sale of hoverboards. We’ll update this story when we hear back. Amazon is the third retailer, after Toys ‘R’ Us and Target, to stop the sale of hoverboards after the CPSC’s notice.